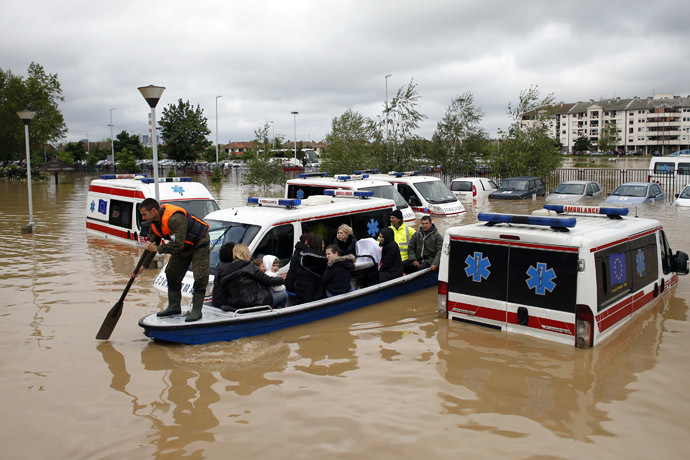 JNN 20 May 2014 Kosovo : The overall death toll in the unprecedented floods that have raged across the Balkans has reached 44, as more bodies were recovered from the Serbian town of Obrenovac on Sunday. The Russian team of 76 rescuers has mostly been working in the worst-hit Serbian town of Obrenovac. In total, over 24,000 people in Serbia have been evacuated as a result of several days of heavy rains, according to Sunday’s estimate announced by the head of the sector for emergency situations at the country’s Interior Ministry, Predrag Maric. Vucic said the biggest danger was still presented by the Sava river: it has not overflown thanks to kilometers-long sandbag barriers. In the area of Sabac city, the water has been standing at a level of 6.6 meters, but if the water rises to 6.8 meters it will spill over the barriers. Survivors of the most severely flooded regions have found temporary shelter in schools, university campuses and hotels. They shudder to recall what they went through and to think of what lies ahead. Officials in the disaster-affected countries have not yet come up with estimates of the damage caused by the floods, but they already expect those to be astronomical. The agricultural sector, on which the economies of the Balkan countries rely, is expected to bear the brunt of the record flooding. This entry was posted in Jafria and tagged humanitarian aid, Obrenovac, Prime Minister Aleksandar Vucic, Serbia. Bookmark the permalink.